This sapphire engagement ring has a strong art deco vintage-inspired vibe to it. The velvety blue centre sapphire is accented by two marquis-shaped diamonds, two rectangular baguettes, and a variety of round diamonds set with milgrain to create a vintage-inspired feel. 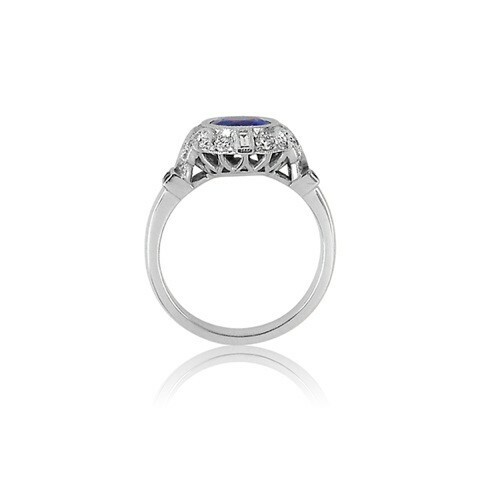 Two square sapphires on each side of the ring complete the design and echo the sapphire colour on the band. Sapphire is the traditional gift for celebrating a 45th or 65th wedding anniversary or birthday, and it is also the birthstone for September. In ancient times, people thought sapphire could protect against evil spirits and creatures of the night. There are a number of famous blue sapphires, including the sapphire that Prince Charles selected for Princess Diana (now Kate's) engagement ring. The name sapphire derives from the latin word "sapphirus", which means blue, and the Greek word “Sappheiros”, which means “precious stone”. There are many shades of blue sapphire, which occur naturally when a sapphire crystal grows in the presence of titanium. The darker colours are often described as Kashmiri, as the best of these stones come from Kashmir. Montana sapphires (also a nod to origin) tend to be dark blue with a hint of green. The lighter colours, often from Sri Lanka, are usual described as "cornflower" or Ceylon sapphire. 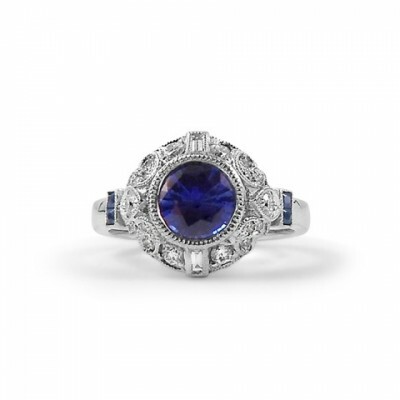 This is one of several sapphire engagement rings in this vintage-inspired series. Click here to see a sapphire engagement ring with a European cut diamond in the centre, and here for a sapphire engagement ring featuring an oval blue sapphire.